Enjoy the luxurious exotic Javanese aura when you visit Taman Sari Royal Heritage. This site was formerly used as a resort of Empire Ngayogyakarta party (Old Mataram Kingdom). In front of the site, we would be greeted by a gate with traditional architecture blend between Chinese, Indian, Muslim, Java, and Spain. Is "Demang Tegis", a Portuguese national engineer who converted to Islam and blend into society Jogja, who later became the architect of this site (Tegis = the Portuguese / Portuguese). 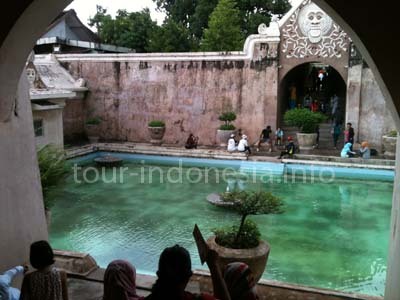 After passing through the entrance gate, we entered the bathing area named:"Umbul Binangun-Bath" used by the Sultan, his wifes and concubines, and children and relatives. In the pool there is a left-wing view of the tower. It is said that the first Sultan often standing on the tower and then threw a shawl to the wives and concubines who were in the pool below. Whoever can catch the scarf, then she has the right to sleep and rest with the Emperor in the room beneath it. 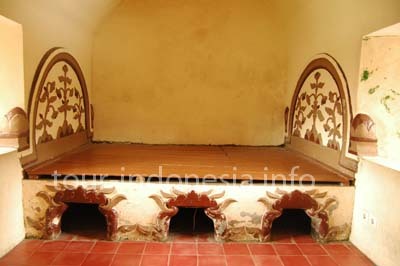 In the north wing of the Taman Sari complex, there is a building which was built in the basement. Historically, it was used as an underground mosque, which also functions as a place to discuss with the Sultan of all his people to strategize against Dutch colonialism. The complex is made ​​with a two-story circular plan, with a central point to access up and down stairs. In the middle of these stairs are well Gumuling. In the western part of the plan, there is a mihrab where the imam (leader of prayers). At the entrance of the mosque there is an access road to the south are currently closed. That said, this is the access that previously used by the monarchy to communicate with residents of the South coast (invisible axis). 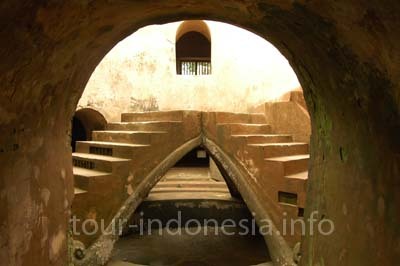 Taman Sari with it's thousand of mystery and beauty remains a favorite tourist destination in Jogjakarta City. Book Discounted Hotels in Yogyakarta Here! Amanjiwo Resort, price start from IDR 10.200.000/night, Melia Purosani Yogyakarta 1,250,000, Hyatt Regency Yogyakarta start from 1,000,000, Royal Ambarrukmo Yogya 900,000, Ibis Malioboro Yogyakarta 800,000, Novotel Yogyakarta start from Rp. 775.000, Shantika Premier Yogyakarta start from 825.000, Yogyakarta Sheraton Mustika 850,000, Hotel Jayakarta Yogyakarta start from 800.000, Hotel Inna Garuda start from 925.000, pop! Yogyakarta 500,000, Grand Aston Yogyakarta price start from 1,175,000 , Yogyakarta Cakra Kusuma Hotel 550,000, d'Omah Tembi Guesthouse start from 750.000/night, Tembi Homestay Yogyakarta start from 350 000/night.